The EtaControl® technology from ONI, a further development of the ONI machine optimization system developed about 30 years ago, is an ideal approach to solving the problem of energy costs effectively and quickly for plastics processors. The electricity consumption of the injection moulding machines accounts for the lion's share of the electricity bill and a significant share of the total costs for the plastics processor. 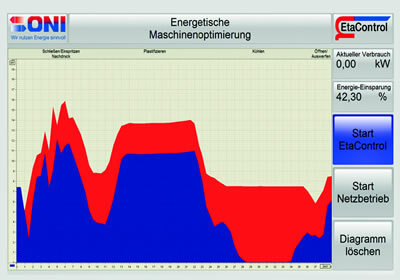 This explains why machine manufacturers have been intensifying their energy optimization measures for years. However, the demand profiles of the buyers collide with those of the machine manufacturers. The buyer wants a low-cost, energy-optimized all-rounder that covers the product range from high-speed yoghurt pots to sophisticated technical moulded parts. Although the machine manufacturer supplied an all-rounder for the favourable price, it had to cut back on energy optimisation. The injection moulding machines built up to about three years ago therefore have a specifically high energy consumption due to the still relatively limited optimisation, depending on the range of articles produced. In addition, plastics processors are confronted with the requirements of DIN EN ISO 50001 "Energy Management System", which calls for continuous improvement of energy-related performance in order to achieve a better energy and environmental balance (keyword "CO2 savings") through greater energy efficiency. The EtaControl ® technology from ONI is the ideal solution for effectively tackling energy cost problems in a short time. An approach, based on a market assessment, should illustrate the enormous savings potential. According to a cautious estimate, there are about 50,000 injection moulding machines in Germany alone with clamping forces ranging from 2,000 to 54,000 kN (average 6,500 kN), which are more than five years old and have an annual number of operating hours of 5,000. 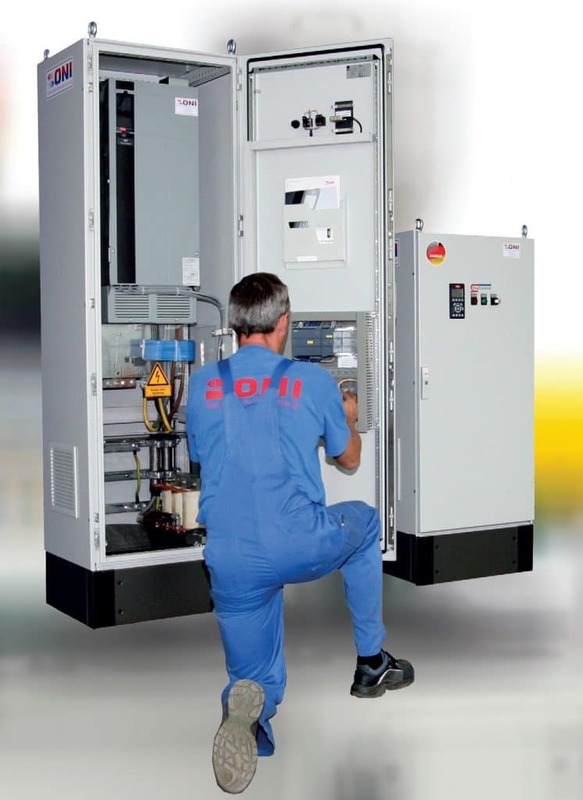 If the power requirement of 60 kW of a 6,500 kN machine is taken into account, the estimated annual power consumption is 15,000 GWh with a connected load of 3,000 MW. If it is possible to reduce 1/3 of the connected load by using the EtaControl technology developed by ONI, a fossil-fuel power plant with an output of 1,000 MW can be completely shut down and the plastics processors can reduce their energy costs by around 550,000,000 euros if an electricity price of 0.11 euros per kWh is taken into account! At the heart of this technology is a controlled oil flow management system that automatically adapts to the energy requirements of the machine in the cycle sequence and the respective moulded part as required. In addition to intelligent control based on Siemens S7 control technology, other hardware components such as frequency converters, soft starters, bypass switches, du/dt or sinusoidal filters are individually adapted to the respective machine. In addition to a low-cost variant EtaControl ® LC, EtaSave is an energy recovery system that feeds excess power back into the in-house power grid and subsequently ensures further energy optimization. An optional bypass circuit also increases ease of operation when switching to mains operation. In a broad field application at ONI customers, with a wide range of moulded parts and machines, power consumption reductions of up to 53% were achieved on injection moulding machines! On average, the approx. 1,600 machines that have been equipped with this technology to date have achieved a power savings rate of 36% ... while maintaining the same cycle time and product quality. A special advantage of EtaControl® technology is that the full performance spectrum of the injection moulding machine can be called up at any time. If we have aroused your interest and you would like to find out more about the possibilities of energy optimisation on your machines, then simply contact us. We will be happy to advise you.